At Tutu Heaven we are proud fans of accessorizing! 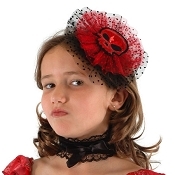 Our collection of fascinators will complement any ballet, dance or any other themed outfit. Fascinators are becoming increasingly popular around the world and can tie an outfit together in style. We feature a black and white bat fascinator, a red, frilly skull fascinator, and an orange and black pumpkin-themed fascinator. Shop today!